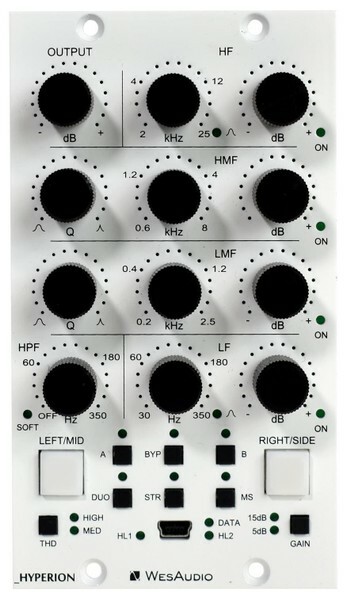 _HYPERION is fully analog parametric EQ with +24dBu of headroom. It features a lot of innovative improvements that no other processor on the market provides. Its innovative design utilizes 15 VCAs per channel to provide essentially noiseless parameter changes and very musical nature. _HYPERION is next product in NG500 line where total recall is implemented through front panel USB socket or _TITAN chassis. 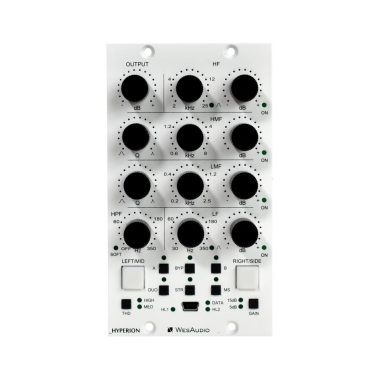 _HYPERION is fully analog device with +24 dBu of headroom. It’s innovative design utilizes 18 VCAs per channel. _HYPERION can work in 3 different modes, including MS, which makes it perfect solution for multiple applications! For easy comparison, each band can by independently bypassed, dialing new sounds in, has never been that easy! THD stands for “Total harmonic distortion” and it allows to saturate your signal with beautiful analog color. WesAudio is a manufacturer of profesional audio equipment since 2010. Company is divided into two departments, where first is responsible for analog processors with digital recall, and second for classic pure analog equipment. Both departments however share same goal, create beautiful sounding analog equipment with great modern features, and all of that for affordable price. We strive to assure that our products are of high quality and precision. We provide full warranty and service of all the equipment available for sale. Each device created in our lab, is designed by WesAudio founder – Radoslaw Wesolowski. Radoslaw is mastermind behind our analog sound and person with passion. He started to work with audio processing in late 90s, building countless processors on customer’s request. When he realized that his signature sound was always there, he decided to name it – WesAudio. Whole software design, including GCon protocol and ng500 concept with our flagship _TITAN has been created by Michal Weglicki. His experience in software development starts in 2000, and since then he worked in major IT departments like “Cloud Networking” or System Architecture in 4G radio networks. Michal’s allegiance however, always lied with music, and in 2013 he decided with Radoslaw to start new WesAudio chapter - creating new department for hybrid devices.